With the BBC Weather forecast suggesting a drop in temperature for Baslow over night with the added bonus of clear skies and 2 knots of wind, the game was a foot for some misty Derwent Valley-ness from Curbar Edge. Despite the sun not rising until 0715 at this time of year, I was up at 0500 (much to my wife’s chagrin) and out on Curbar Edge by 0600. I love getting to a spot early, I hate rushing and getting myself flustered (which is true for the rest of my life too). Getting there early meant for me a chance to stroll in along the edge listening to the noise of stags bray near by and to enjoy the fireworks as the horizon turned from deep blue to a rich orange with the clouds overhead reflecting the richness. Aside from my dog the only company was two other photographers who crept past as they stalked after the stags, saying a quiet “Hello”, as they went on their way. As is usually the case for me, by the time the sun cleared the horizon, my camera was packed and way and I was enjoying the view eating my breakfast and drinking my coffee. Afterwards, I headed on to Padley Gorge, which you can read about here. 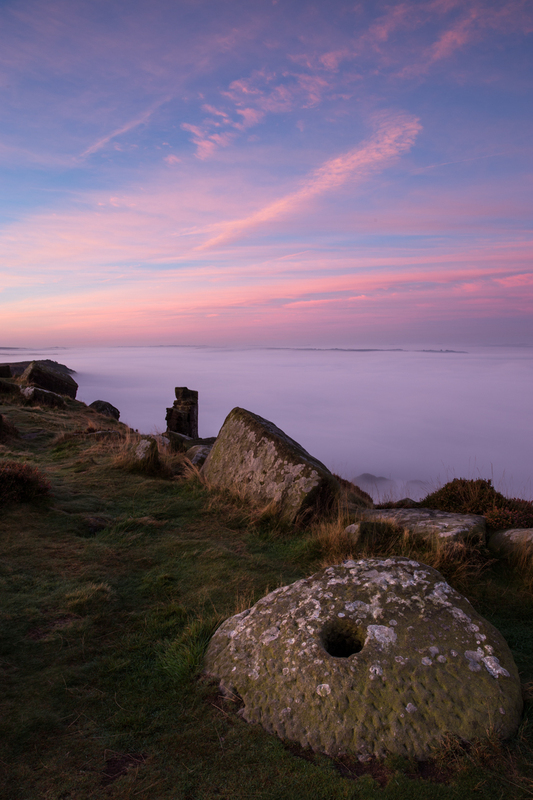 You can see more of my Peak District landscape photography in my gallery.